Expanding, Upgrading or Building a new Park? • Load calculations and voltage drop calculations per NEC guidelines. 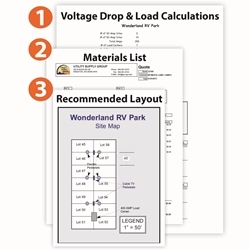 • A recommended circuit layout on your site plan. Pedestals, meters, distribution panels, utility metering, wire and lighting. • An Itemized bill of materials and detailed price quotation. We have provided hundreds of electrical layouts nationwide. Large or small we can provide you with an economical and feasible solution to help expand your business.